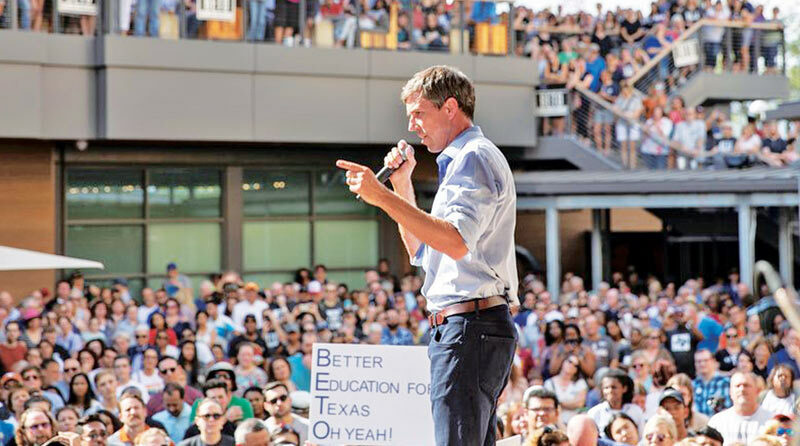 US: Beto O'Rourke, a skateboarding former punk rocker feted as one of the Democratic Party's rising stars, announced Thursday he is running for President -- joining a crowded field of candidates vying to challenge Donald Trump in 2020. “The only way for us to live up to the promise of America is to give it our all and to give it for all of us,” O'Rourke, 46, said in a video, filmed alongside his wife in their El Paso, Texas home. O'Rourke has been discussed as a potential frontrunner since dazzling the grassroots during an unexpectedly tight race last year to unseat Texas Republican Senator Ted Cruz, his charismatic stump performances and message of inclusion turning heads in Washington. O'Rourke has entered a pool of 14 other Democrats seeking to oust Trump. They include several US senators -- Elizabeth Warren, Kamala Harris, Cory Booker, Kirsten Gillibrand, Amy Klobuchar and the leader among current candidates, liberal powerhouse Bernie Sanders. On Thursday morning, O'Rourke was already taking questions from voters in Keokuk, Iowa -- following in the footsteps of other Democrats keen to raise their profiles in the state that will vote before any other in the 2020 primary process. He has vowed to run a positive campaign that would seek to “bring out the very best from every single one of us” and unite a country riven by political, social and cultural fissures. “You can probably tell that I want to run,” he told Vanity Fair in this month's cover story, featuring a photography spread by Annie Leibovitz. In the article, published online hours before his official announcement, O'Rourke acknowledged his ambition for the top job -- although he stopped short of confirming his run. “Man, I'm just born to be in it, and want to do everything I humanly can for this country at this moment,” he said. To one Iowan's question on running alongside so many other Democrats, O'Rourke said it was “critically important that we not denigrate, demean any other candidate.” “Any single Democrat running today... would be far better than the current occupant of the White House,” he said to applause. O'Rourke, a bassist in the moderately successful El Paso band Foss who became known for going skateboarding to blow off steam on the Texas campaign trail, has been tipped to quickly achieve rockstar status. As a three-term Congressman, O'Rourke was more politically cautious, joining the House's centrist, pro-business New Democrat Coalition.